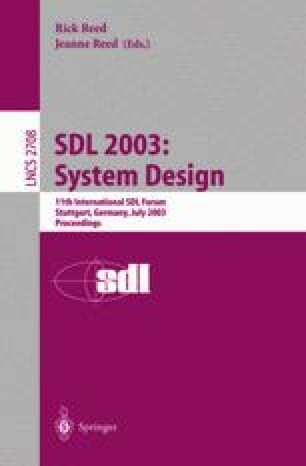 This paper describes the formal approach to modeling IETF Session Initiation Protocol (SIP) and its services in SDL. The main objective is to discover the advantages and shortcomings of using a formal language such as SDL to model an IETF application signaling protocol: SIP. Evaluating the feasibility of using CASE tools such as Telelogic Tau in modeling a protocol as complex as SIP is also the interest of this study. By creating an “Abstract User” interface, we discover the importance of use case analysis in specifying SIP services more precisely. In addition, the object-oriented extension in SDL-96 has been applied to some extent in the modeling process; we create an SDL framework that allows us to reuse and to add SIP services to the core protocol more easily by applying SDL type inheritance in our model. Furthermore, we discuss enhancements that may be made to the SDL language and Tau tools to improve the modeling experience of IETF protocols. Telelogic Inc.. Telelogic Tau SDL & TTCN Suite, version 4.3 and 4.4. http://www.telelogic.com, accessed on Dec 20, 2002. J. Lennox, H. Schulzrinne, T. Porta. Implementing Intelligent Network Services with Session Initiation Services. http://www.cs.columbia.edu/lennox/cucs-002-99.pdf, accessed on October 7, 2002. Object Management Group Inc.. Unified Modeling Language. version 2.0. http://www.omg.org/uml/, accessed on Feb. 12, 2003. Ø. Haugen, MSC Methodology. SISU, DES 94, Oslo, Norway, 1994. Access on 23Dec2002 http://www.informatics.sintef.no/projects/sisu/sluttrapp/publicen.htm. B. Stroustrup. Stroustrup: C++. http://www.research.att.com/ bs/C++.html, accessed on Feb 10, 2003. Sun Microsystems Inc. The Source for JavaTM Technology. version 1.x. http://java.sun.com, accessed on Feb 10, 2003. Microsoft Inc.. Visual Studio Home Page. http://msdn.microsoft.com/vstudio, accessed on Feb 10, 2003.